Kakt. and. Sukk. 5:113-119, 1995. Basionym: Navajoa peeblesiana Croizat var. fickeisenii Backberg ex Hochstätter, Succulenta, Netherlands 73 (3): 131-1142, 1994. Type: Backeberg (1961) " USA (Arizona) 300 miles as the crow flies west from the type locality of Navajoa peeblesianus, at ca. 1,500m on the slopes of the south sides of low mountains in the area of the north side of the Grand Canyon. The type is in my collection." Lectotype: Lyman & Robert L. Benson (1982), 15745, June 28, 1957, POM 285 856. Paratype: (flowering) Lyman & Evelin L. Benson 16086, April 21, 1961, POM 299 969. Two specimens from exactly the same place. " The Cacti of the US and Canada" 1982. The type was not aknowledged (see IOS Repertorium Plantarum Succulentarum 1992): the validation of the name is unsuccesful as two type specimens are cited. New holotype: Kanab Plateau, Arizona, fieldnumber fh 051.1, June 1994, HBG. Navajoa fickeisenii Backeberg Cact. & Succt. J. (GB) 22 (3):49, 54, 1960, nom. inval.(Art.37.1). Navajoa fickeisenii Backeberg, Die Cactaceae 5:2873-2876, Abb.2700-2702, 1961 nom. inval.(Art.8.2). Pediocactus peeblesianus var. fickeisenii (Backeberg) L. Benson, Cact. & Succt. J. (US) 34:59-60, 1962, nom. inval. Toumeya fickeisenii Earle, Cacti of the Southwest ed.2, 98, 1963, USA, nom. inval. 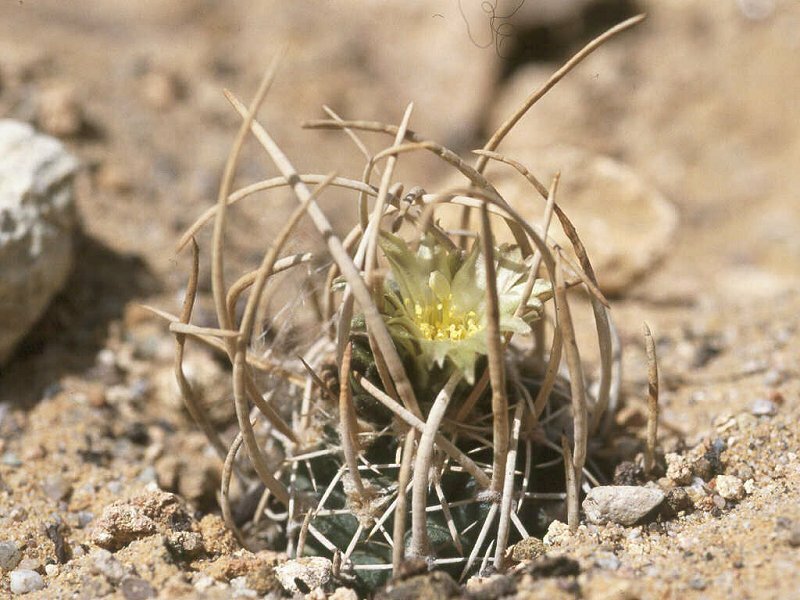 Pediocactus peeblesianus var. fickeiseniae (Backeberg) L. Benson, The Cacti of Arizona, ed. 3, 23-24, 186-187, 1969, nom. inval. Pediocactus peeblesianus ssp. fickeisenii Lüthy, Kakt. and. Sukk.50 (11):278, 1999.